It’s been an unusually hot summer in NYC this year, which is just fine by me. As a native from Southern California, I welcome the bright sunny days and the warmth of the summer heat on my skin. But add in the humidity of the east coast, and I just can’t take the heat of slaving away over a hot stove all day. So we’ve been eating light to stay cool and and keep our tummies flat for bikini season. But just because you’ve lightened up on your meals doesn’t mean you can’t still eat like a princess. Here are 2 wonderful, low calorie dishes that are still bursting with flavor. When I was about 3 years old, my grandmother took me to a fruit farm in the Taiwanese countryside, and I ended up stuffing myself with all the strawberries my 3 year old belly could fill. Through my berry stained lips, I exclaimed, “Strawberries are my favorite food in the world!” Since then, not much else has changed. Strawberry is still my favorite flavor for ice cream, candy, and jam. So when summer comes, I get giddy to savor them in their ripe juicy splendor. Its tangy-ness pairs well with the nectar sweetness of summer peaches, and together, they make for a delectable salad perfect for a summer evening on the porch. In a frying pan, toast the almonds for a few seconds. Drizzle in some beer over the nuts. Add the remaining 1/4 c. of agave nectar and a pinch or 2 of cayenne pepper. Toss until everything is well mixed and continue until nuts are carmelized and sticky and beer has evaporated. Set aside. 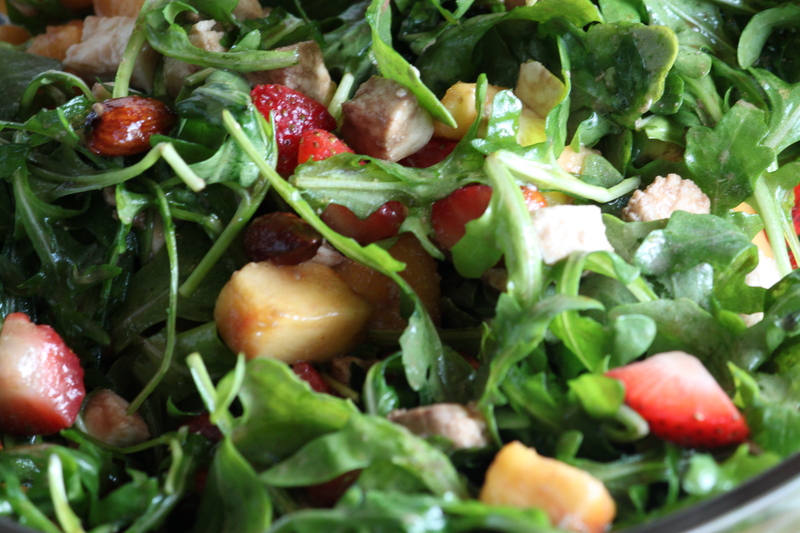 In a large salad bowl, toss together arugula, peaches, strawberries, mozzarella, and almonds. Combine olive oil and balsamic vinegar. 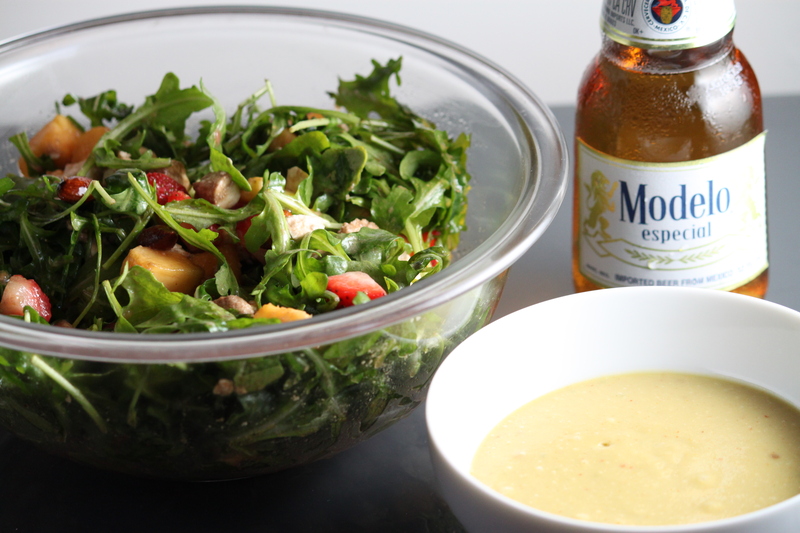 Drizzle over the salad and toss until everything is combined. 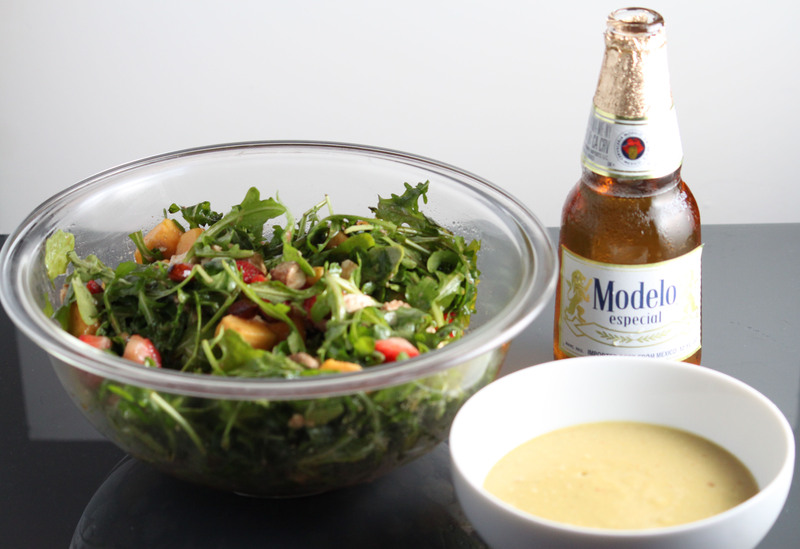 Enjoy the salad with the remaining bottle of ice cold beer! Growing up in Los Angeles, we had many friends and neighbors who were lucky to have avocado trees in their yards. Every few weeks during peak season, they would drive over bearing a whole box of them, and because I had the privilege of eating them too often, I am embarrassed to say that I grew up not liking avocados. 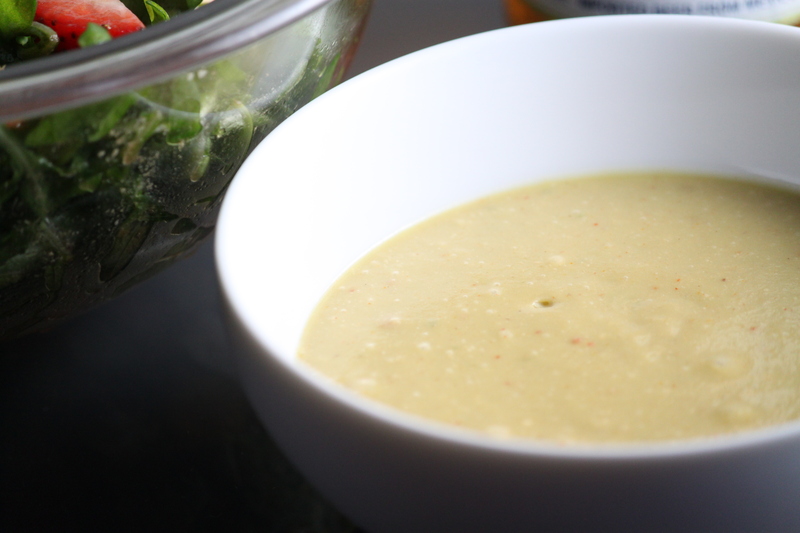 But after moving to NYC, all I wanted was avocados – I wanted them in my salads, I wanted them in my omelettes, and today, I want them in my soup! This soup is smooth, velvety, and luscious as can be, with robust flavors and a surprising spicy bite to it. Every spoonful reminds me of the lazy Californian summers of my teenage years. Combine all ingredients in a blender and blend until smooth. Can’t get any simpler than that! Tip: Avocados are quite creamy, so depending on how thick you prefer your soups to be, you can feel free to adjust the amount of creme fraiche/milk proportions. I ended up adding a tad more milk to thin out the texture. Now stop sitting in front of your computer – go whip up some summer meals and enjoy it al fresca with a nice bottle of beer/glass of wine!